Boston, July 11. 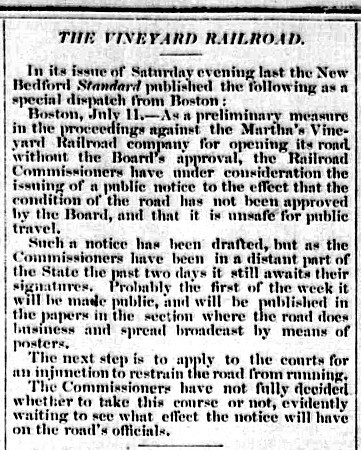 - As a preliminary measure in the proceedings against the Martha’s Vineyard Railroad company for opening its road without the Boards approval, the Railroad Commissioners have under consideration the issuing of a public notice to the effect that the condition of the road has not been approved by the Board, and that it is unsafe for public travel. Such a notice has been drafted, but as the Commissioners have been in a distant part of the State the past two days it still awaits their signatures. Probably the first of the week it will be made public, and will be published in the papers in the section where the road does business and spread broadcast by means of posters. The next step is to apply to they courts for injunction to restrain the road from running. The Commissioners have not fully decided whether to take this course or not evidently waiting to seee what effect the notice will have on the road’s officials. Joseph M. Wardwell, of Edgartown, who is the proprietor of the road, was in the city this noon, and in conversation with a Standard reporter said that the whole thing is a scheme on the part of the people of the island who are anxious to have an electric road between Cottage City and Edgartown. He says that he has been away all winter, and returned to Edgartown in March, and during the month of May commenced making repairs to the road in accordance with the suggestions of the Railroad Commissioners. The locomotive has been thoroughly overhauled and fitted with new fire box, and made in perfect condition. This was done at quite an expense. The road bed has been repaired, and 500 sleepers laid or being laid, and during the season at least 500 more will be put in. These repairs have all been made on the six miles of the road between Cottage City and Edgartown. He will visit Boston on Monday and call upon the Commissioners to learn more of the particulars. Whether the Board will let the matter rest where it is for the present, or that the notice is only preliminary to injunction proceedings, the Gazette does not pretend to know. We trust the former. We are not inclined to go deeply into this matter at the present time. Suffice it to say that the prohibiting of trains running on the road in the middle of our summer season, cannot but work very seriously to the interests of Edgartown - be little short of a calamity. We have yet to find a patron of the road this year, and acquainted with its condition for the past few years, who does not unhesitatingly declare that in his opinion the locomotive and track are in better condition today than in some years past, when the Railroad Commission have passed upon and allowed the road to operate. For our part, and we believe we voice the almost unanimous sentiment of the citizens and summer residents here, we sincerely hope the running of trains over the road will not be prohibited by the Commissioners.